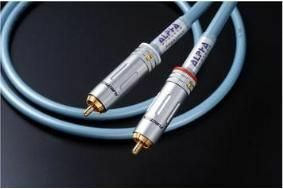 Furutech expands RCA cable range with entry-level ADL Alpha Line | What Hi-Fi? There are three models: the Alpha Line 1 (£79.95), Alpha Line 2 (£139.95) and Alpha Line Plus £209.95). All prices are for a one metre pair. Each model has copper alloy 24k gold-plated RCA connectors, the Alpha 1 and 2 using a U-OFC conductor and copper alloy body with Teflon coating; while the Alpha Line Plus has two cores twisted together with cotton filler, and a resonance damping unwoven barrier layer. The Alpha 1 is finished in a flexible blue PVC jacket, the Alpha 2 in dark green and the Alpha Line Plus in black. They're distributed in the UK by SoundFowndations.